The Dataset creator can grant access to the specific slices of data (rather than the entire Dataset). This is accomplished via a User Map. The User Map restrictions will also apply to any Reports created from this Dataset. What is a User Map? User Map: Allows you to grant Users access to limited amount of rows. 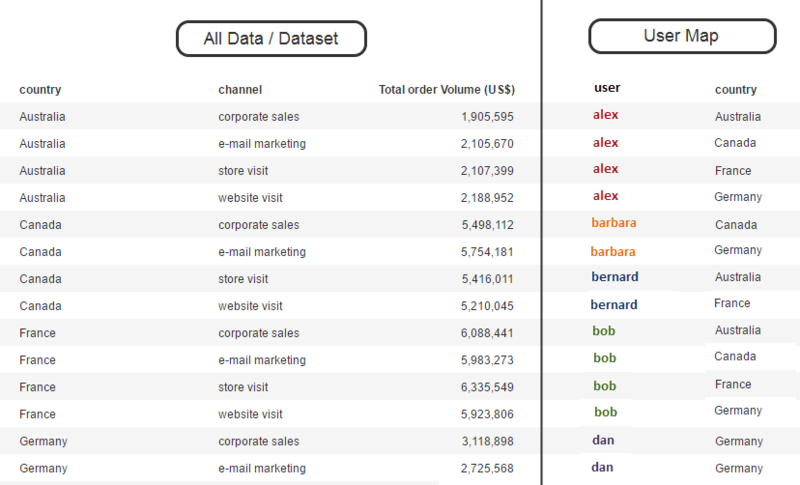 It must contain a column with usernames and specific values in the Dataset columns to filter data to a relevant subset. A User Map dimensions the result set with ALL information and makes different mappings available to the designated users. In this example, User access is restricted to specific Countries. If the User Map is applied to a Dataset, all included users will not see the Dataset with ALL available values but will view the Dataset differently according to the User Map restrictions. The same rules apply to elements created from this Dataset. 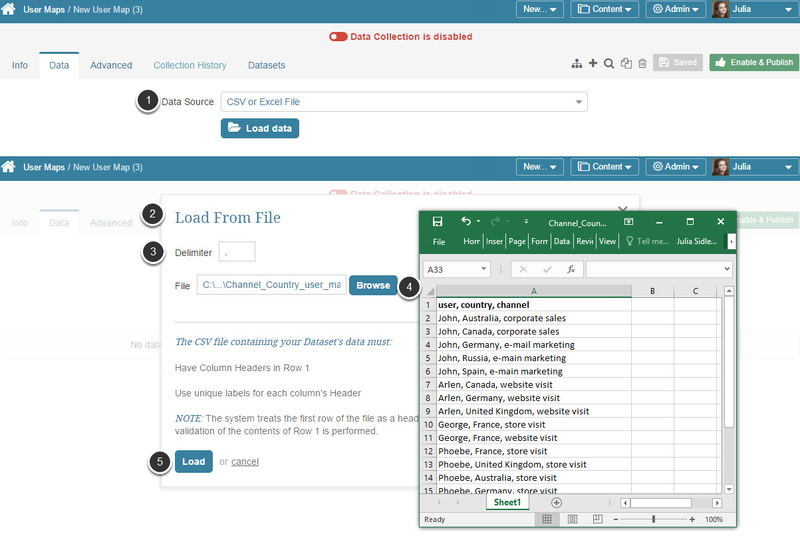 In the example below, both Country AND Channel is mapped to the Dataset in order to further restrict the results that are available to each user. At the bottom of the page click [+ New User Map]. Data Source: Select the method of collecting the data for User Map. In this example, data is uploaded via 'CSV or Excel file'. When this method is selected, click Load data below this field and define a date for which you are adding data to the Dataset. Click Browse and select the CSV file containing data for the User Map. This file must contain a column with usernames and a column (or several ones) with values to which respective users may have access.